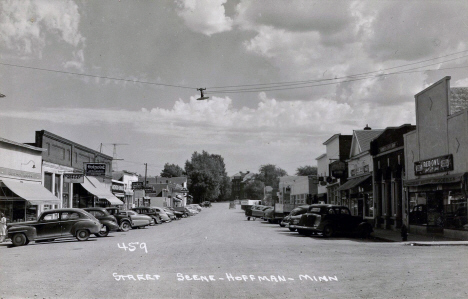 Do you have photos, historical accounts or other items pertaining to the Hoffman area? Would you like to share this historical information with the world? LakesnWoods.com would like to publish your Hoffman photos (current or historical) or historical accounts on this website. Original materials can be returned and your privacy will be respected. 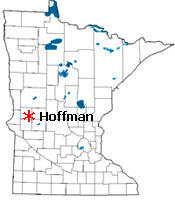 The city of Hoffman is located in West Central Minnesota. 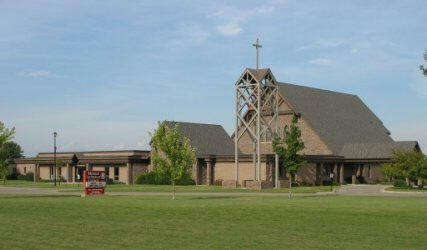 It was founded in 1886 when the rail-line came through this area of Minnesota and was incorporated as a city in 1891. The population of Hoffman today is 681. 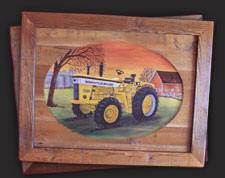 Hoffman is often referred to as the area where the hardwood forests end and the western prairies begin. Two rivers run near Hoffman; the Chippewa to the east and the Pomme-de-Terre River to the west. 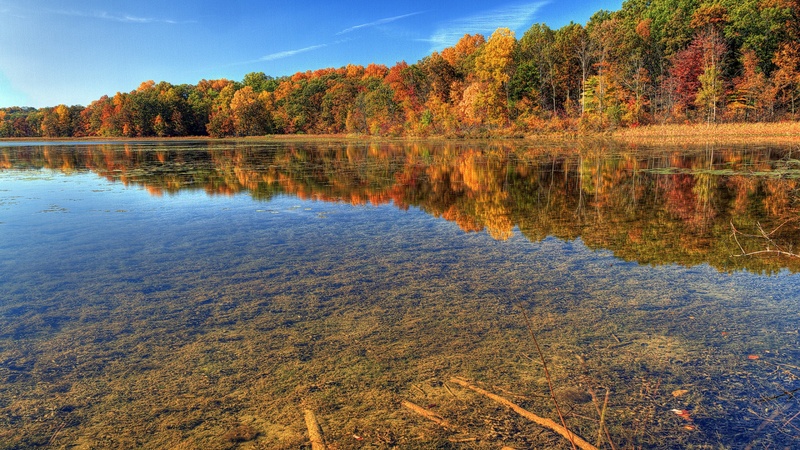 There are many beautiful lakes in the surrounding area making it a serene and pristine area in which to live. Hoffman is a city in Grant County, Minnesota, along the Chippewa River. 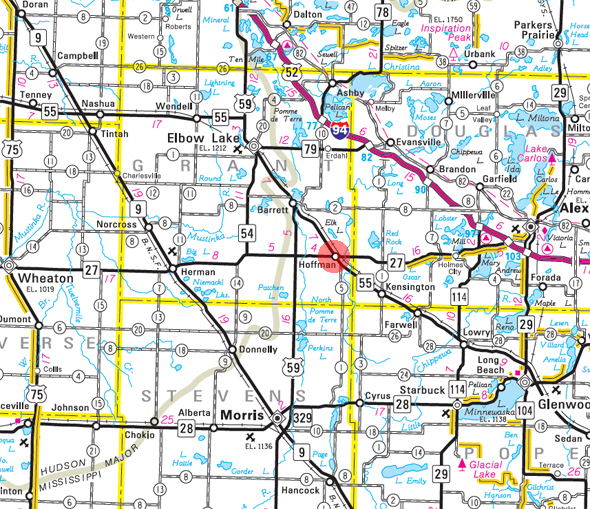 Minnesota State Highways 27 and 55 are two of the main routes in the community. According to the United States Census Bureau, the city has a total area of 2.07 square miles (5.36 km2), all of it land. The elevation is 1,247 feet (380 m). As of the census of 2010, there were 681 people, 285 households, and 150 families residing in the city. The population density was 329.0 inhabitants per square mile (127.0/km2). There were 325 housing units at an average density of 157.0 per square mile (60.6/km2). The racial makeup of the city was 95.7% White, 0.1% African American, 0.4% Native American, 0.6% Asian, 0.1% Pacific Islander, 1.6% from other races, and 1.3% from two or more races. Hispanic or Latino of any race were 3.1% of the population. There were 285 households of which 25.3% had children under the age of 18 living with them, 41.1% were married couples living together, 7.4% had a female householder with no husband present, 4.2% had a male householder with no wife present, and 47.4% were non-families. 39.3% of all households were made up of individuals and 21.1% had someone living alone who was 65 years of age or older. The average household size was 2.24 and the average family size was 3.07. The median age in the city was 43.2 years. 21.6% of residents were under the age of 18; 6.4% were between the ages of 18 and 24; 24.6% were from 25 to 44; 22.3% were from 45 to 64; and 25.1% were 65 years of age or older. The gender makeup of the city was 47.7% male and 52.3% female. HOFFMAN, a railway village in Land Township, platted in April 1887, incorporated June 23, 1891, was named in honor of Robert C. Hoffman of Minneapolis, who during many years was chief engineer of the Soo Line. The village was developed on land purchased by the Minneapolis and Pacific Railroad in 1886 from Andres Lindberg; it had a hotel, several stores, and a grain elevator; its post office began in 1883 as Wanberg, located near Wilson Lake on postmaster Anton Studling (Studien)'s farm; it transferred to the Louis Peterson farm in 1884 and to the village in 1887. City Council Meetings first Monday of each month (unless 1st Monday falls before the 3rd of the month) 7:00 pm in the council room of the Hoffman Community Center. Located in West Central Minnesota, just north of Hoffman, we invite you to browse our site and see what we have to offer in hunting, fishing, lodging, sporting clays and 5-stand shooting. 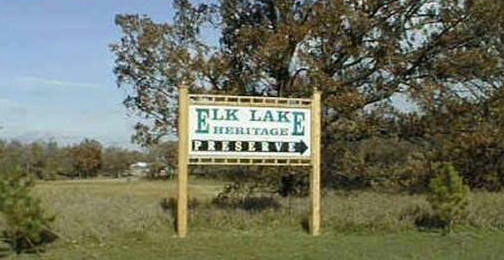 We want your experience at Elk Lake Heritage Preserve to be a most memorable one! 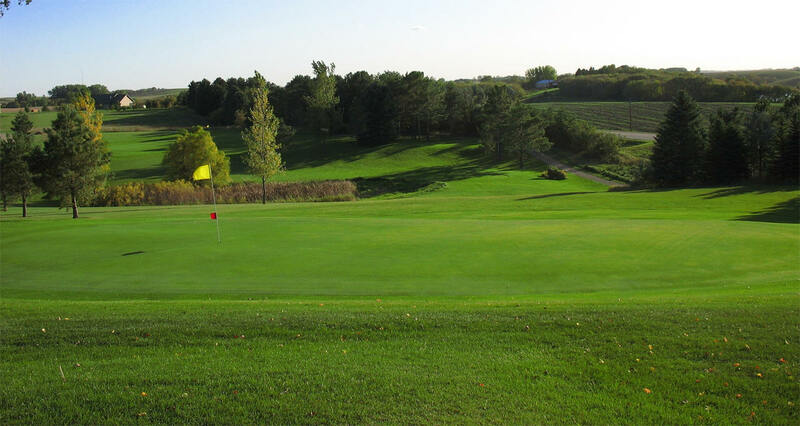 Red Rock is a privately owned 9-hole golf course which challenges any player. Experience the unexpected relaxed style that will bring you back to play it again. Located on the southern tip of Elk Lake, this city owned campground has 26 well-maintained sites. Reservations for monthly or seasonal sites can be made. Shorter visits are on a first-come, first-served basis. Campsites have electrical, water and sewer hookups. A dumping station is also available. A public watercraft landing and beach are adjacent to the campground. Open mid-May through mid-September. When you need to lift, transfer, rotate, position or reach, Advanced Manipulator Specialists, Inc. is your answer to optimized material handling. We are proud to present our traditional handcrafted furniture The natural aged look, with unique nail holes and weather checking, cannot be matched by any distressed wood process. Prairie Lakes Coop (prairielakescoop.com), a division of CHS, provides products and services in the agronomic, energy and grain markets to meet the needs of its patrons. We provide service for telephone, cable TV, internet and long distance to customers in West Central Minnesota. Our goal is to provide the most advanced products and services to our customers, without being in the big cities, at the most cost competitive rates and provide customer service right in your neighborhood.